Final Phase TS EdCET 2019 Web Counselling, Exercise Web Options Entry: The qualified candidates of TS Ed.CET-2019 Examination are informed to attend the final phase certificate verification for exercising online web options for admission into two years B.Ed. course for the academic year 2019-2020, as per G.O. MS. No 24, dated: 24/08/2017, on the dates mentioned against their state-wide rank and methodology, in any one of the Helpline Centers (HLCs) with all original certificates as detailed below. 4. Tuition fee reimbursement will be as per the rules of state governments of Telangana. Income certificate issued by MRO after 01-01-2019 will only be considered. The students of Andhra Pradesh have to pay the full fee. 12. On the notified date, the web options are processed and allotment is communicated to the candidate through SMS. 16. 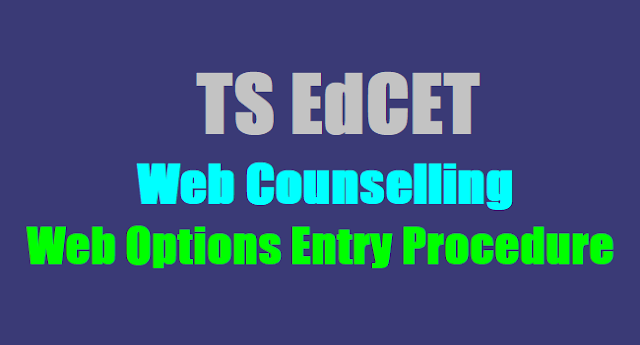 For latest updates, visit the website http://tsedcet.tsche.in. 2. Certificates Verificatioin: ..-07-2019 to ..-07-2019. 29. Candidates can give web options from helpline center or internet cafe or house as per the schedule given in the notification. 30. Attention: PH / NCC / Cap/ Sports and Games Category:PH / NCC / CAP/ Sports and Games Category candidates shall exercise their web options as per schedule of the TS Ed.CET-2019 State ranks (Refer web notification). First phase lo clg report aindi .kani clg chala dooram undi. Second phase lo options pettukovacha. When will be the phase 2 options will open. there is no proper information for dates of options giving in phase 2. could you let me know?